Thanks to Drs. Ed Hartle, Robert Sterling and Peter Banks, Lake Norman Regional Medical Center, North Carolina, for contributing this case. To contribute a Case of the Week, follow the guidelines on our Case of the Week page. (1) Support PathologyOutlines.com by doing your holiday shopping at Amazon.com. Click here, or on any Amazon banner on the left side of our Home Page to visit Amazon.com. Amazon not only sells books, but DVDs, clothing and even food items. By visiting Amazon via these links, they will send us 4-5% of the cost of all items you purchase (out of their profits), at no additional cost to you. (2) We posted an article on our Management Page, Pathology Salaries and the Big Picture, by Mick Raich, Vachette Pathology, click here. 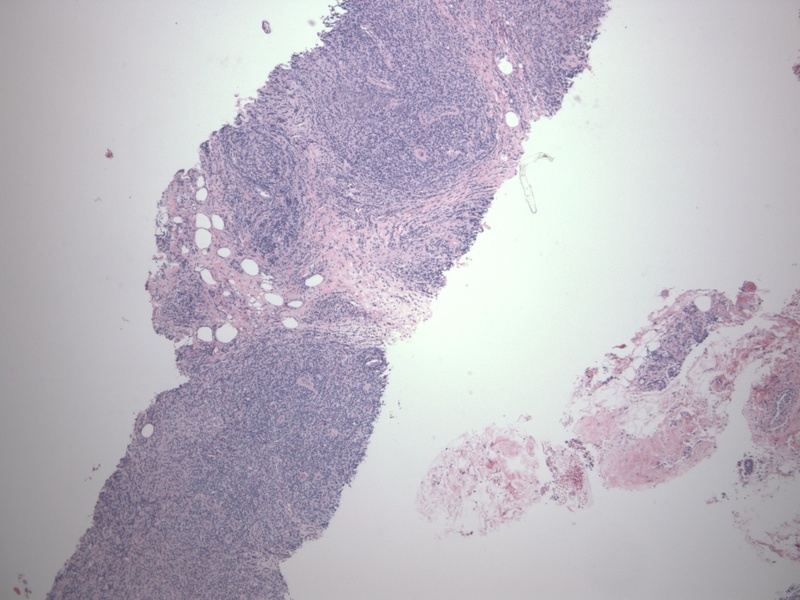 A 37 year old woman presented with a palpable left breast mass. Mammogram and ultrasound showed a 4.5 cm mass without calcifications, characterized as ACR-BIRADS category IV-suspicious. A needle core biopsy was obtained. 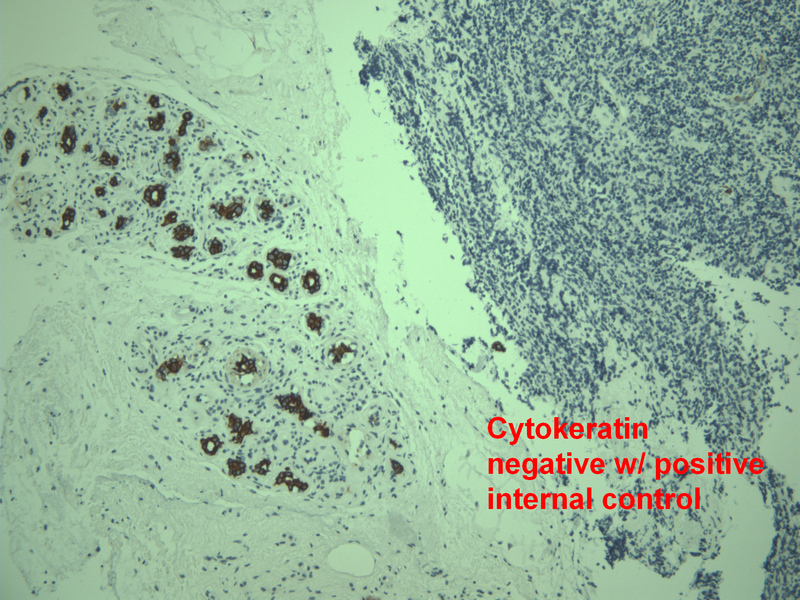 High-grade malignant lymphoma, peripheral T-cell, type not further specified. 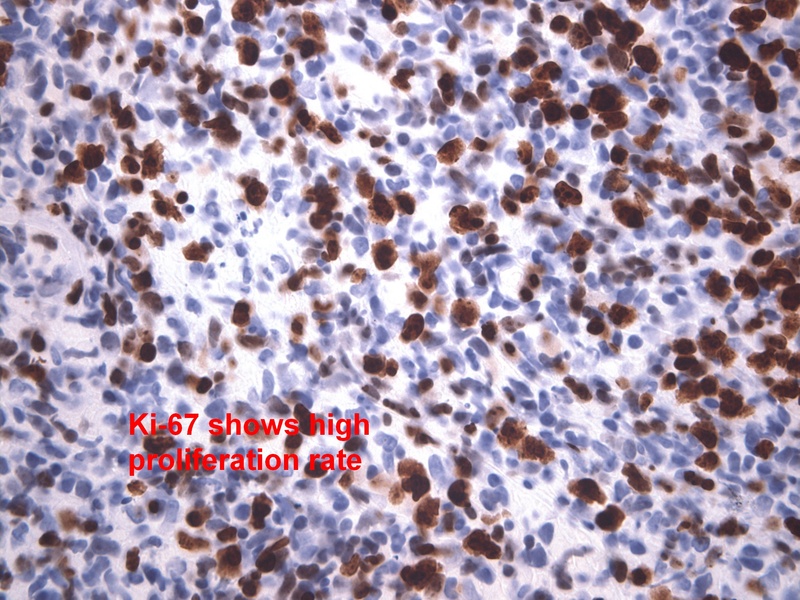 The diagnosis was confirmed by molecular probes which demonstrated a clonal T-cell population using primers for the T-gamma region. Primary breast lymphomas are rare, constituting less than 1% of all breast malignancies. 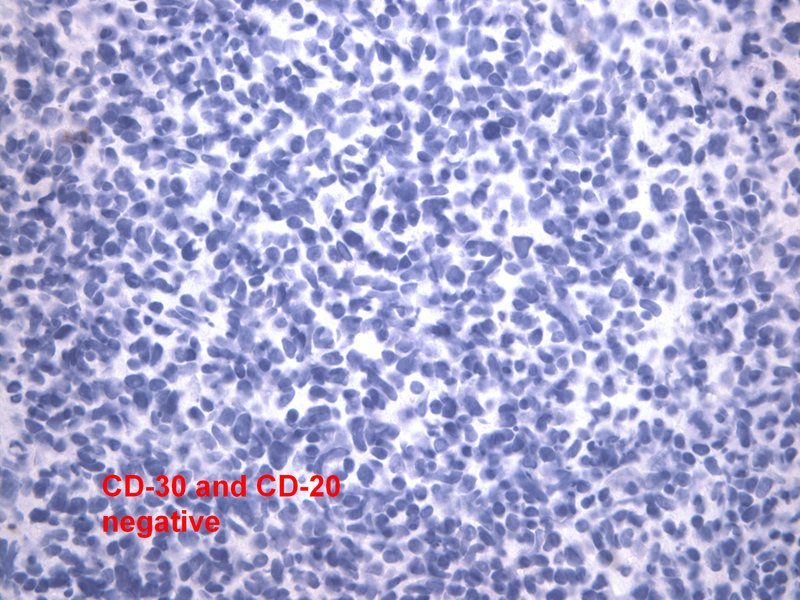 Patients tend to be either ages 30-35 years (diffuse large B cell) or 55-60 years (diffuse large B cell or MALT-type). Screening mammography may be increasing the detection of low-grade lymphoma. The criteria for primary breast lymphoma are: (a) sufficient tissue for diagnosis; (b) close interaction between the lymphoma infiltrate and breast tissue; (c) no evidence of widespread lymphoma at time of diagnosis; (d) no prior diagnosis of nonbreast lymphoma (Cancer 1972;29:1705). Secondary breast lymphoma has a similar incidence as primary breast lymphoma, and is the most common metastatic disease to the breast. 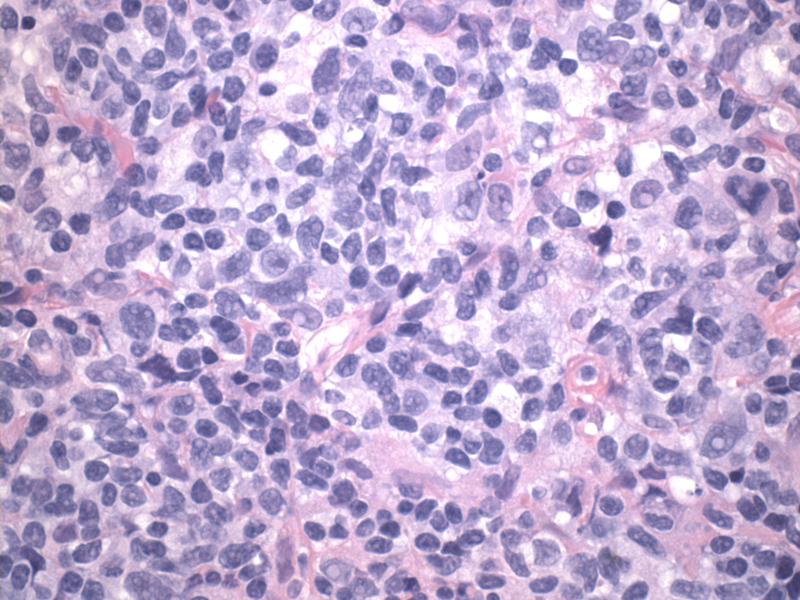 T cell lymphomas of the breast are extremely rare (Mod Pathol 2000;13:599). 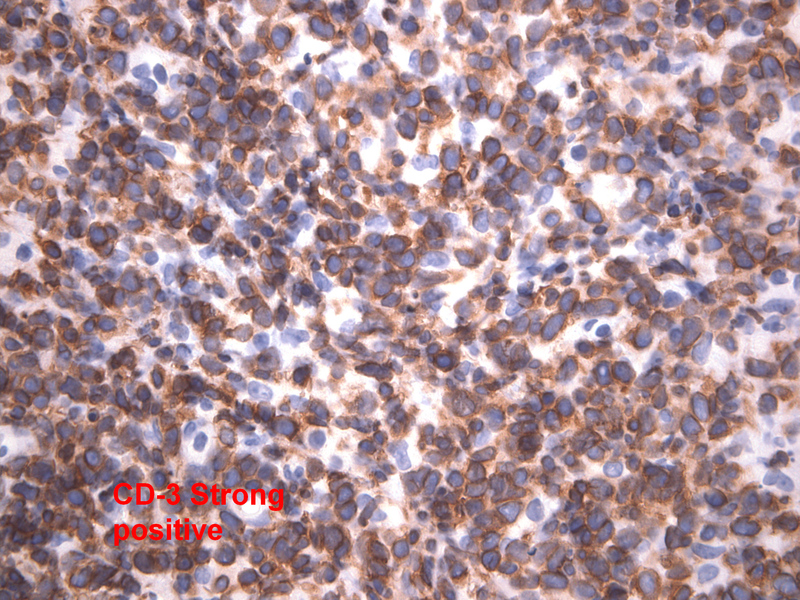 As in this case, these tumors are often considered to be diffuse large B cell lymphomas until immunostains are performed for T and B cell markers. T cell lymphomas of the breast often have aggressive behavior. In this case, the patient responded only briefly to therapy. She subsequently developed jaundice with increased liver function tests. A liver biopsy showed involvement by T-cell lymphoma, and she subsequently died of her disease.